PARIS, Oct 1, 2012/ — Light and dark, feminine and masculine, Bill Gaytten, Creative Director at John Galliano reinterpreted Yin & Yang and Victor/Victoria concept using the sophisticated craftsmanship, cut and construction associated with the House of Galliano DNA. 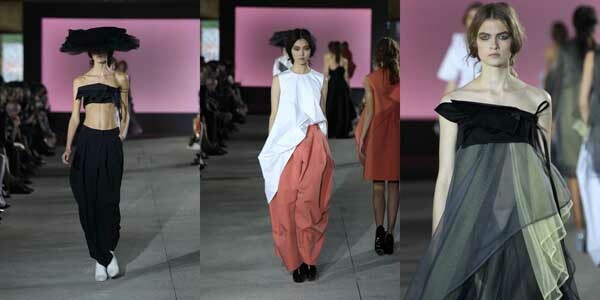 Mixing elements from the Geisha costumes and garcon clothing, Bill Gaytten evoked a new silhouette that proposed clean architectural lines yet has a lot of volume. Draped and fitted jackets are worn with voluminous trousers and statement over-sized shorts. In true Galliano style, there is always an extra treasure in the mix; and this time it is in plain sight. Milliner Stephen Jones created yarrow shaped hats and bird’s nest headwear which evoked an Edwardian elegance as they also define the new modernity of Galliano. Purity of form with over-sized layering contrasts the light versus obi-binding. Cut-away shapes, clean round-necklines and varying asymmetric hems in trench cottons, technical taffeta, crepe, cotton poplin punctuate this contemporary collection. The modern spirit of a woman is refined and romantic in a restrained palette of stone, coral, navy, white, black and pale pink.